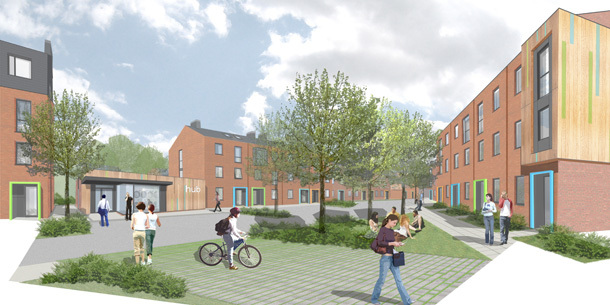 GWP Architecture is pleased to announce that phase 1 of their Denton Holme Student Village scheme has achieved a BREEAM design stage rating of ‘Outstanding’ with a credit score of 86.12%. This is the first scheme of any type to achieve this prestigious rating under the new assessment criteria introduced in 2012. Carlisle Conservative MP John Stevenson, who supported the plan from its inception, congratulated the team involved on its success. “It’s certainly something which we as a city, and particularly the residents of Denton Holme, can be proud of…it is great to see a Carlisle success on the national radar.” He said. The 249 bedroom project that was completed in September 2012 is now home to students from the University of Cumbria. They reside in the 9 & 12 bedroom townhouse units, which are designed to create a sustainable living environment based on the family home. Each townhouse has a shared kitchen, dining and living room on the ground floor with bedrooms and shared WC/shower rooms on the upper floors. These are combined with the Social Hub at the centre of the site that houses the site reception, offices and security as well as the communal laundry facilities. To see further information on the scheme, have a look at the project page.